Difficult week for the Great White North. Two of our finest killed in cold blood by extremist crazies. Warrant Officer Patrice Vincent, a 28 year veteran and tireless advocate of veterans causes, was killed in a targeted hit and run in a Quebec parking lot. Cpl. Nathan Cirillo, a 24-year-old father, and a reservist with the Argyll and Sutherland Highlanders of Canada, was shot in the back while standing sentry at the Tomb of the Unknown Soldier. The extremist then ran into the Parliament buildings where he was gunned down by Kevin Vickers, the sergeant-at-arms for the House of Commons and 29-year RCMP veteran. 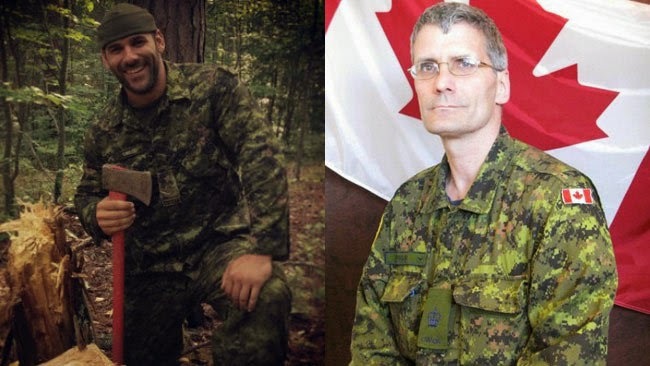 Patrice Vincent and Nathan Cirillo were buried with full military honours. Their families have been deeply touched by the outpouring of solidarity and support from across Canada. And we’ve all been touched by the support of our American cousins, who sang our anthem at NHL games in Pittsburgh, San Jose and Boston. Extremists evidently believe that random acts of brutality destroy morale and breaks a people’s will. This may be true in chaotic places where there is no rule of law, or tradition of stability and good government. But in a free society such acts rouse the spirit and unite the people. Thousands lined Highway 401, the Highway of Heroes, to salute Cpl Cirillo’s motorcade. The leaders of all three major parties, normally ornery as polecats, embraced and declared solidarity, then led the House in the singing of our national anthem. The extremists have poked a polar bear. A hundred years from now the crazies and their cheerleaders will be forgotten. But there’ll still be an honour guard at the War Memorial. And people will still be doing yoga and playing Frisbee on the front lawn of Parliament.